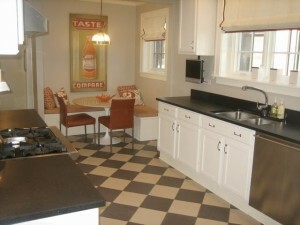 FRANCIS BRYAN REMODELING can work with you to update your outdated kitchen! See the BEFORE and AFTER photos of this historic Beverly, Chicago home. 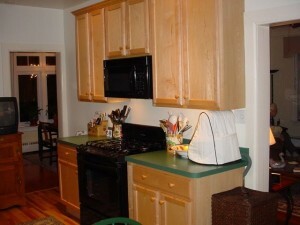 These homeowners updated their eat in kitchen without replacing the existing cabinets or changing the configuration. 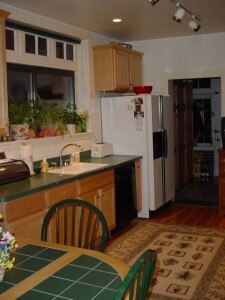 The end result is a beautiful classic/contemporary kitchen for less than half the cost of a new kitchen. Yes, the top 3 photos are the “BEFORE”. 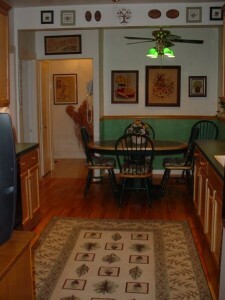 The kitchen was not a disaster by any means, but it was dated, and not in the style, that the homeowners preferred. 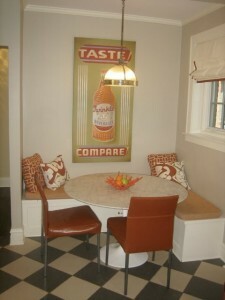 The homeowners wanted a contemporary look with traditional elements and that is exactly what they achieved! Moved the cabinets up the wall a few inches to the ceiling, added crown molding. Had a custom “L” shaped storage bench installed around the eat in dining area. Painted all of the cabinets, cabinet boxes and trim a bright white. Painted the walls a beautiful light neutral color. Installed absolute black “honed” granite counter tops. 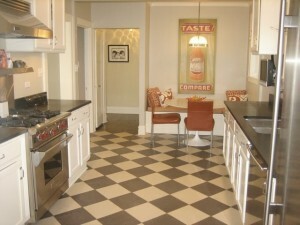 Installed black and white checkerboard porcelain 12 x 12 tiles. Installed new classic hardware on the cabinets. Installed new vintage style light fixtures. 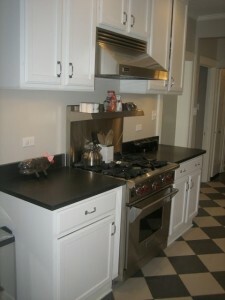 Removed the old appliances and replaced with top of the line stainless steel. Replaced the over the range microwave with an industrial ventilation hood. If you would like to update your kitchen, bath or any area of your home, without spending a small fortune, contact FRANCIS BRYAN REMODELING and we will work with you, your ideas and your budget!